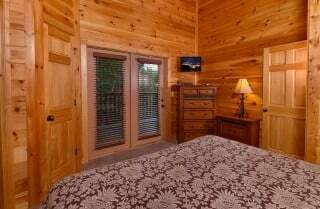 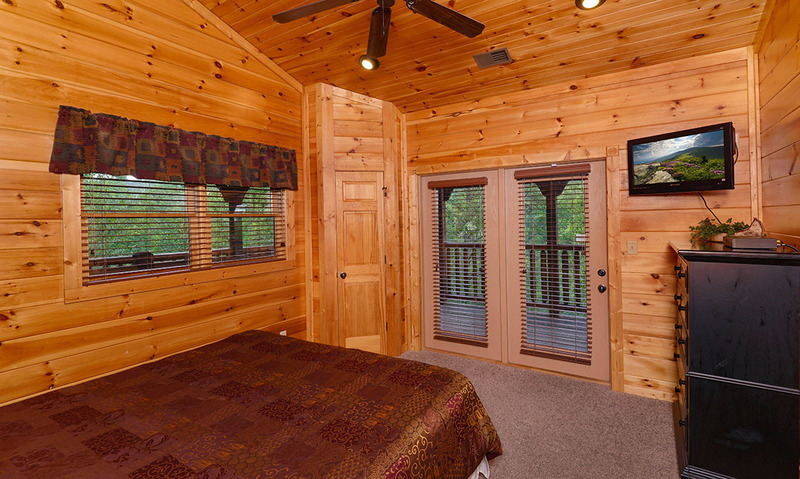 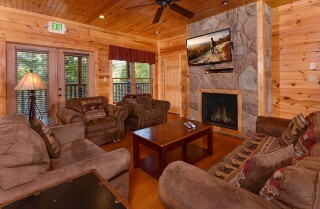 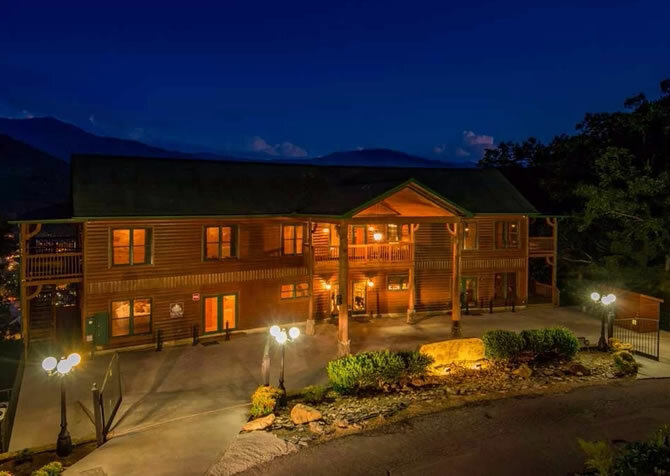 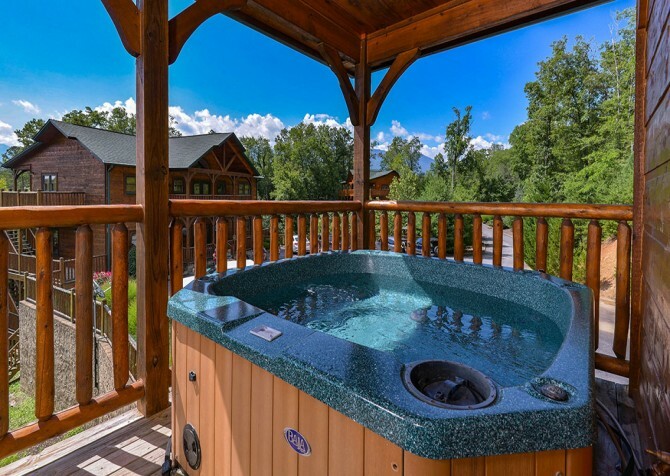 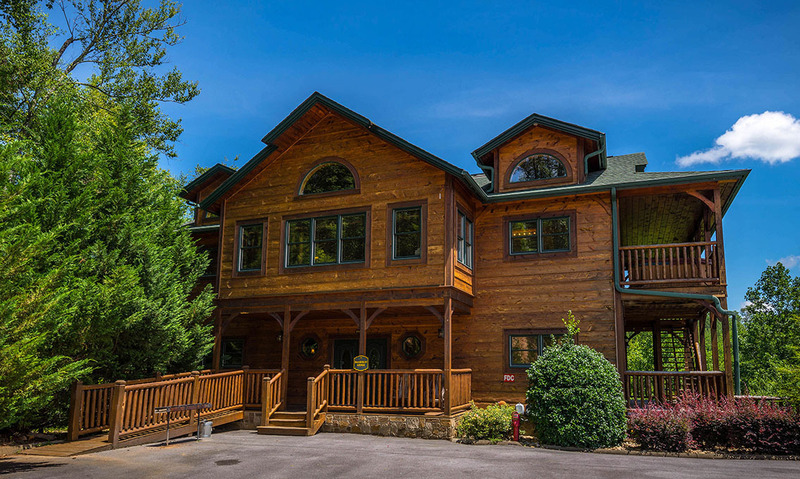 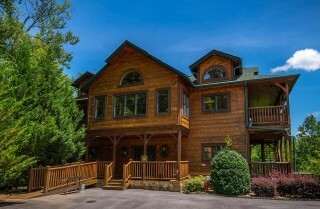 In the Gatlinburg Falls at The Glades resort, Bearskin Lodge is a spacious, comfortable, fun, and classic Smoky Mountain cabin fit for big family vacations, reunions, church and corporate retreats, and celebrating special occasions. It blends games, comfortable furnishings, spaces for kids and adults, and lots of conveniences together for a place you can call home while you’re in the Smokies. 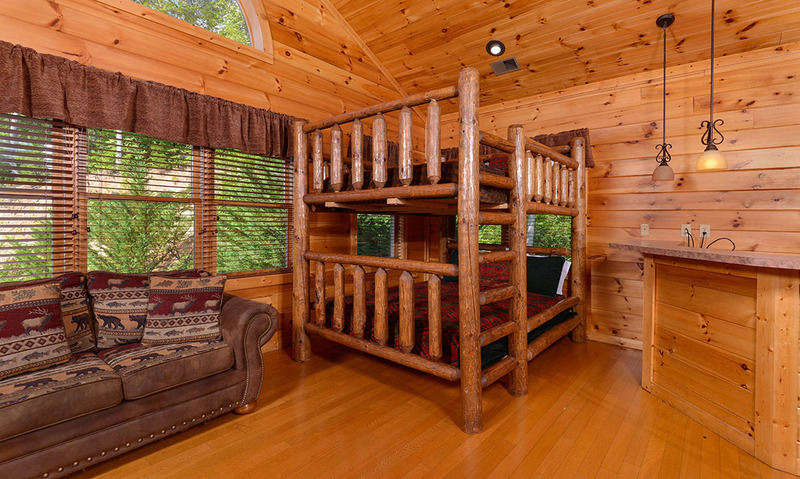 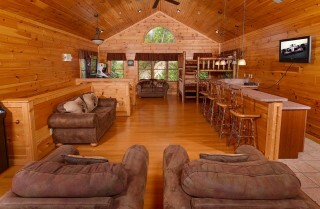 Bearskin Lodge is tucked among the trees, with peeks of the gorgeous Smoky Mountains from the top deck. Three huge decks wrap around the cabin, offering plenty of outdoor space for unwinding. The cabin even has a separate pavilion with a picnic table, perfect for outdoor meals on nice nights. 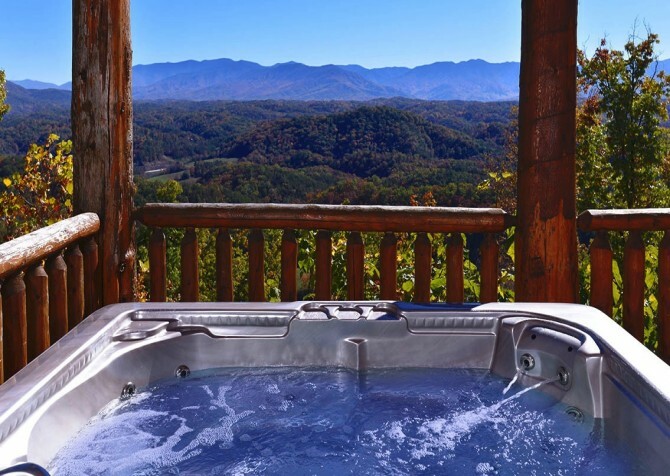 Spend days soaking in the hot tubs, sipping on moonshine in the rocking chairs, and breathing in fresh air while the trees rustle around. 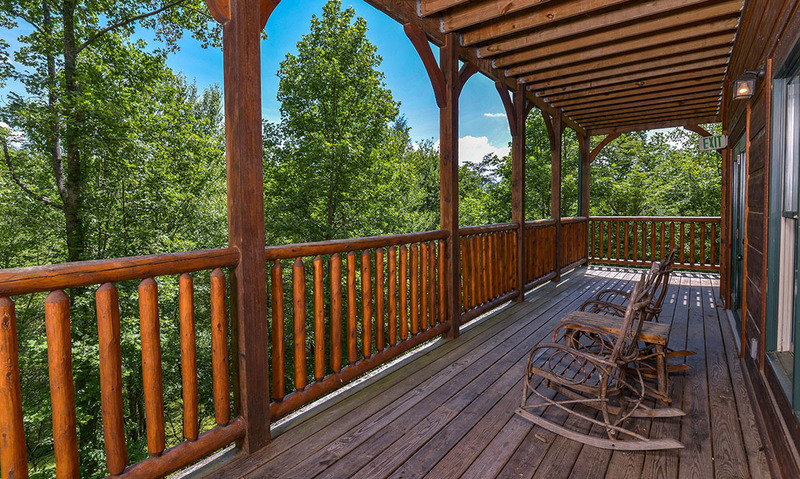 It’s a serene place to rejuvenate and enjoy some peace. 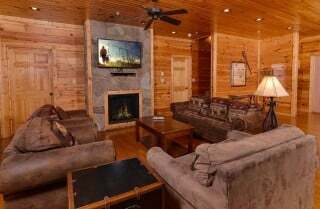 Inside, Bearskin Lodge is all about convenience and fun. 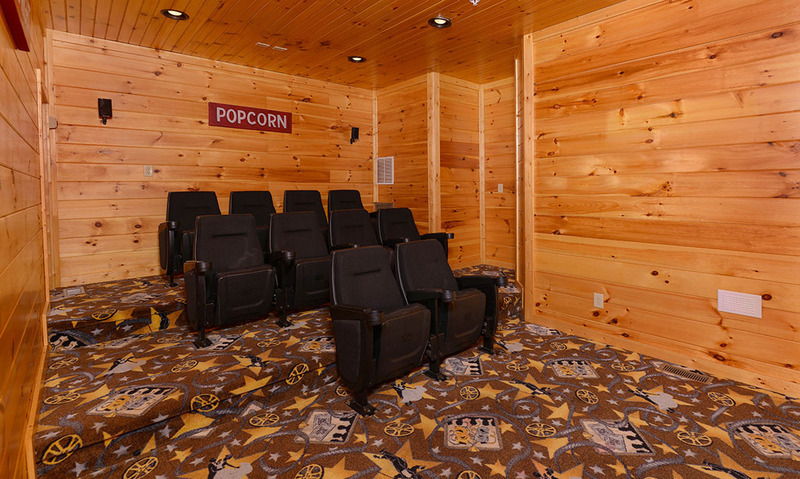 With almost 5,000 square feet of space, it has plenty of room for groups to spread out. 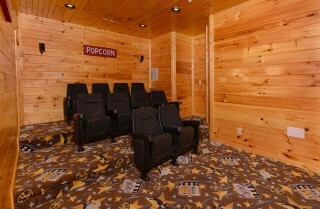 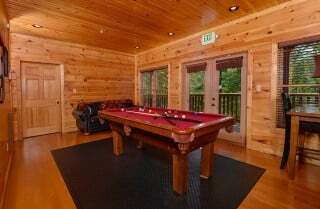 The living room is furnished with cozy seating and a big screen TV; the kitchen boasts double appliances and a large breakfast bar; there is dining space for the whole group in the cabin; the rec room has air hockey and pool; the movie room has theater-style seats; and the bedrooms feature king beds, bunks, and their own TVs. 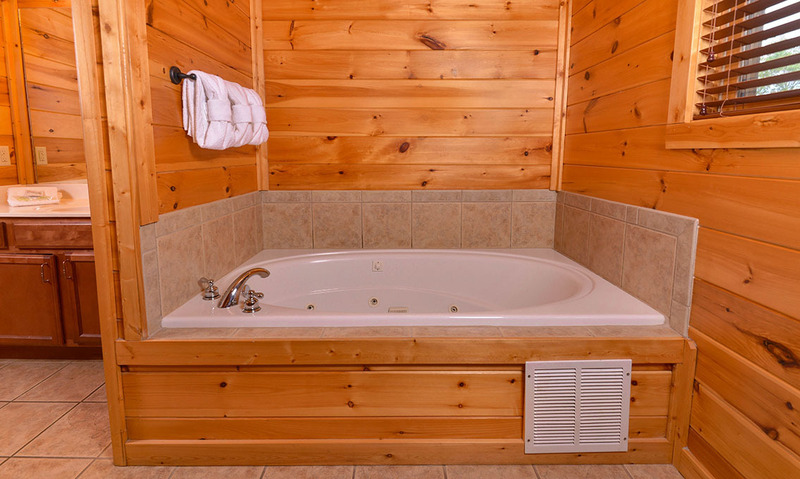 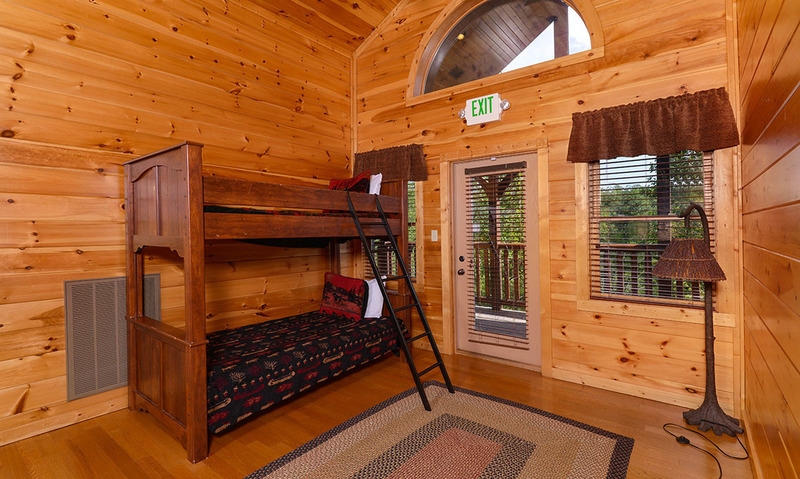 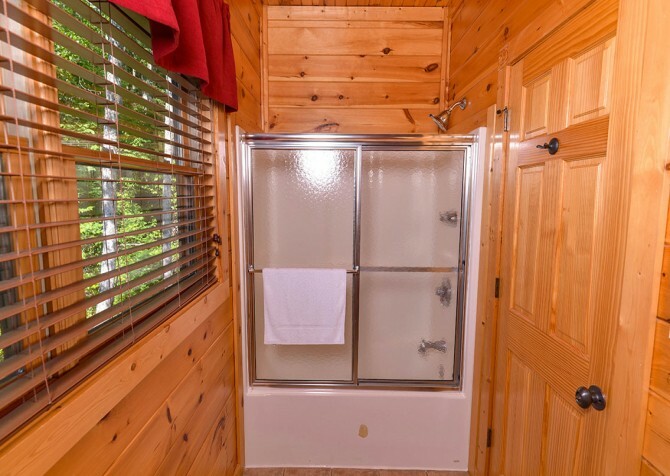 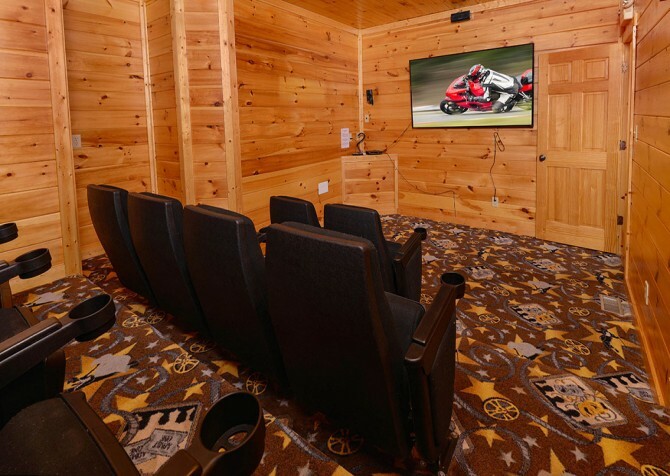 It’s a cabin made for group fun, where everyone can feel at home after busy days playing at Dollywood, hiking in the Great Smoky Mountains National Park, and exploring downtown Gatlinburg’s attractions and shops. 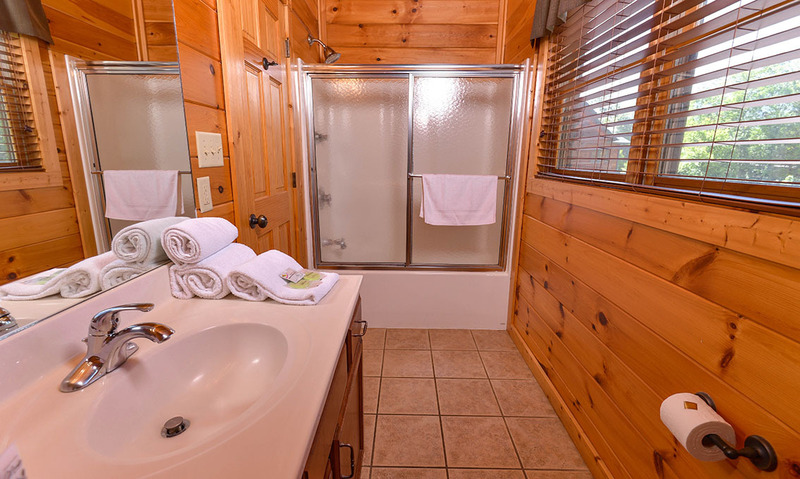 Plus, the cabin features conveniences like a washer/dryer, Wi-Fi, and charcoal grill. Gather around an inviting fireplace in the cozy living room of Bearskin Lodge. 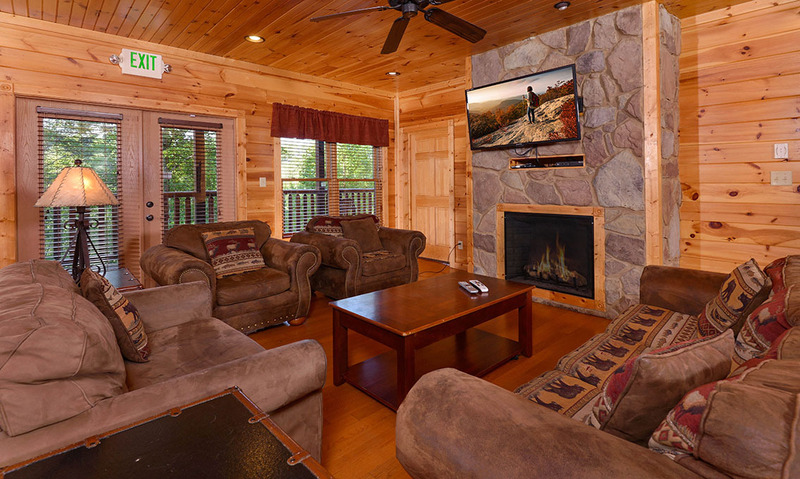 Two plush sofas and two plush chairs flank a stone-faced fireplace with unique wood trim. 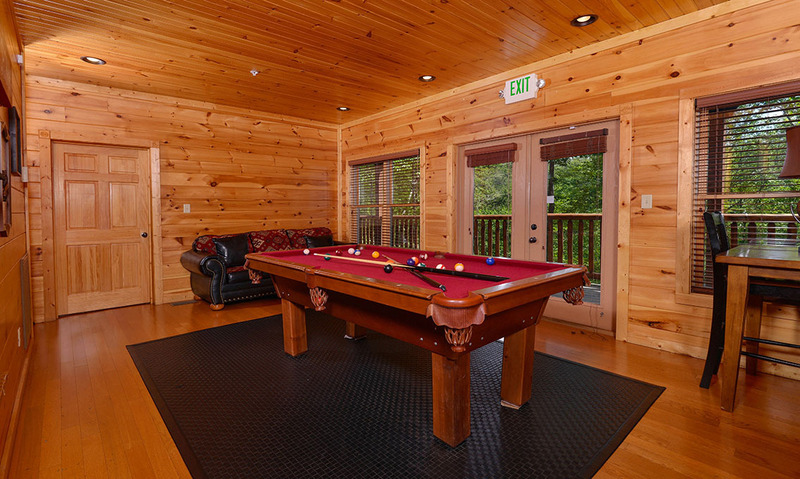 In the center, a coffee table gives space for snacks, drinks, or a board game. 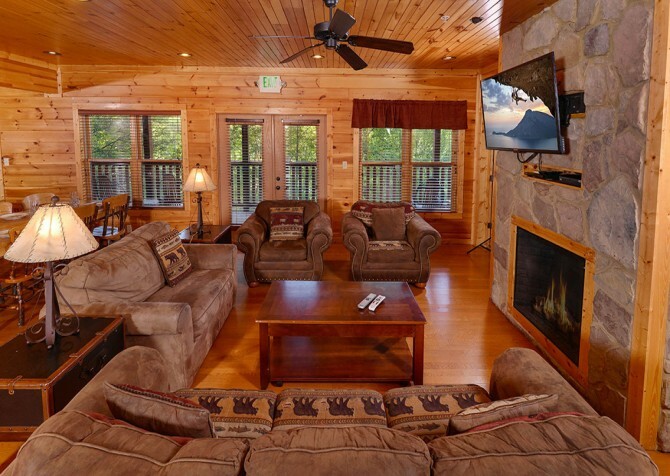 When you’re ready to just relax, cozy up on the sofas, flip on the TV, and watch your favorite shows, a movie, or the ball game. Or you can flip on the tabletop lamp and read on a quiet afternoon. 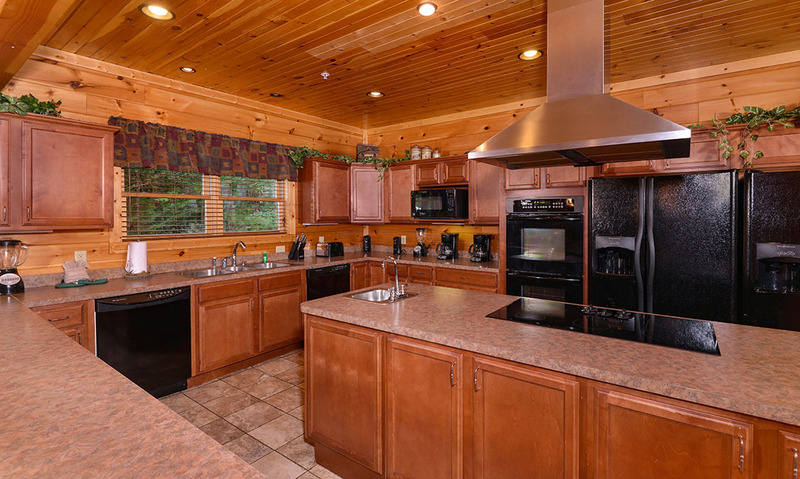 The fully equipped kitchen in Bearskin Lodge makes it easier to feed a group. When you want to cook, you’ll have 2 refrigerators, 2 ovens, 2 dishwashers, 2 sinks, coffeemakers, blenders, knives, a toaster, a microwave, a cooktop and hood in the island, and tons of counter space for prepping meals. 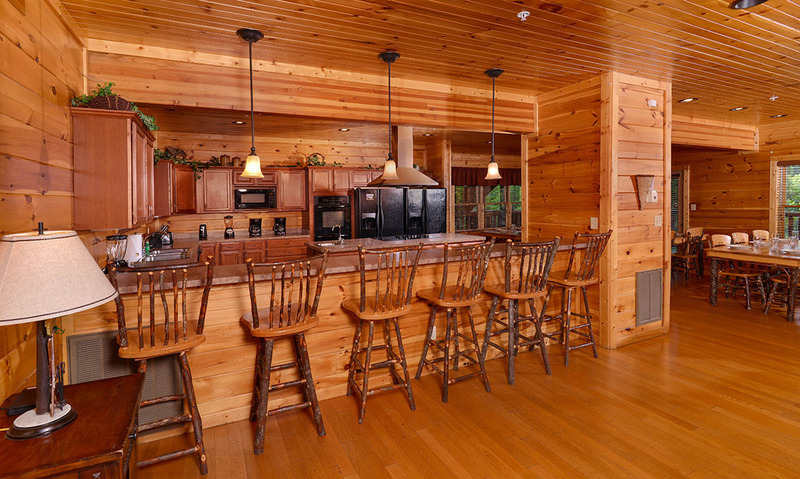 The ample counter space is also great for setting out snacks, drinks, or a buffet. 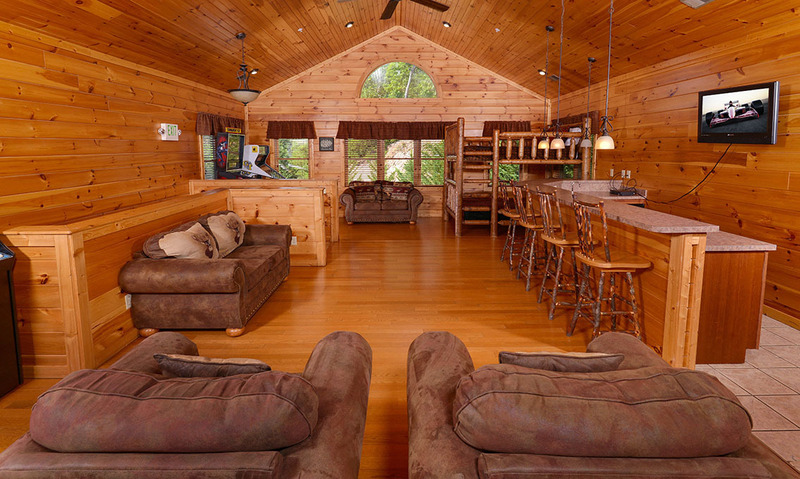 With such a big group, you want to have food on hand at all times – and this cabin makes it easy to do that. 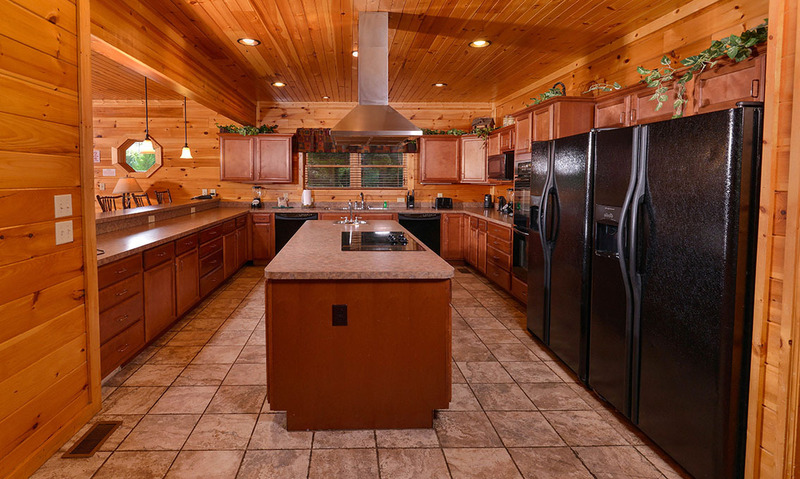 Not up for cooking? You’ll also have plenty of space for leftovers after eating downtown or setting out a spread of catered foods. 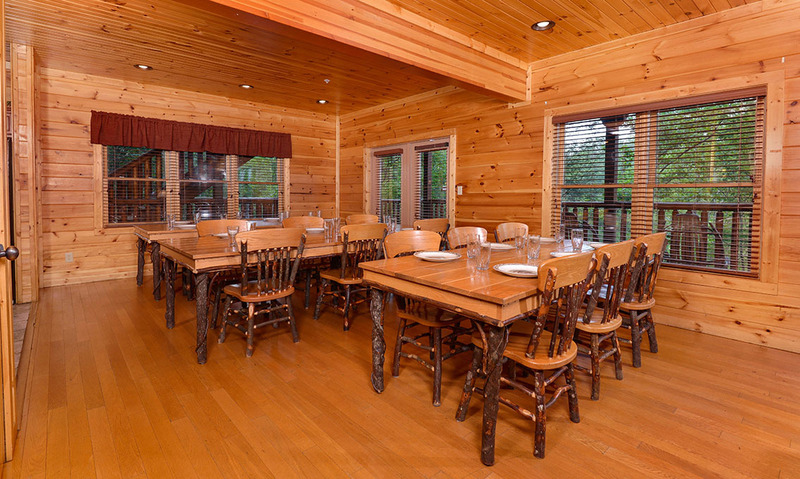 Along with the large kitchen for cooking in-cabin meals, Bearskin Lodge offers a spacious dining room for eating at the cabin. The dining room has 3 log tables with seating for 6 guests each, and the breakfast bar by the kitchen offers seating for 6 more. With other tables and barstools throughout the cabin, you’ll find space for the whole group to eat in the cabin. So whether you’re ordering pizza, whipping up a big spaghetti dinner, having a cookout, or enjoying a catered BBQ dinner, you’ll have the space to enjoy it in Bearskin Lodge. When you want to play but don’t want to get out of the cabin, the rec room in Bearskin Lodge is the place to go. 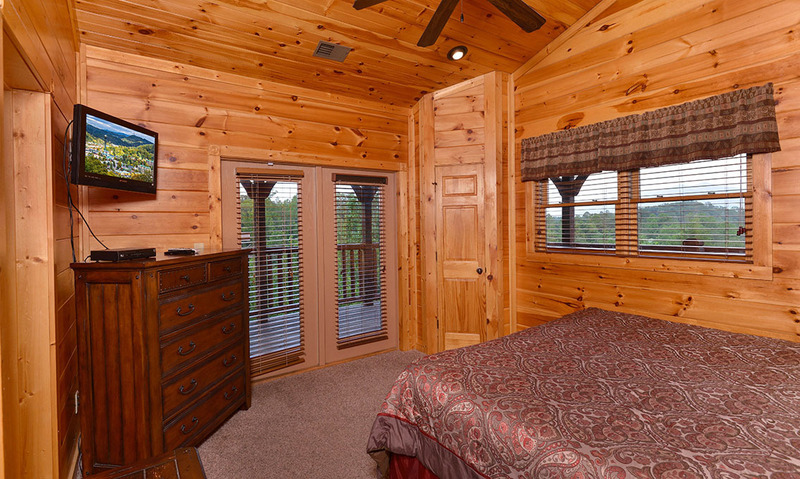 With windows that frame beautiful wooded views, it gives you a taste of the outdoors while you play inside. 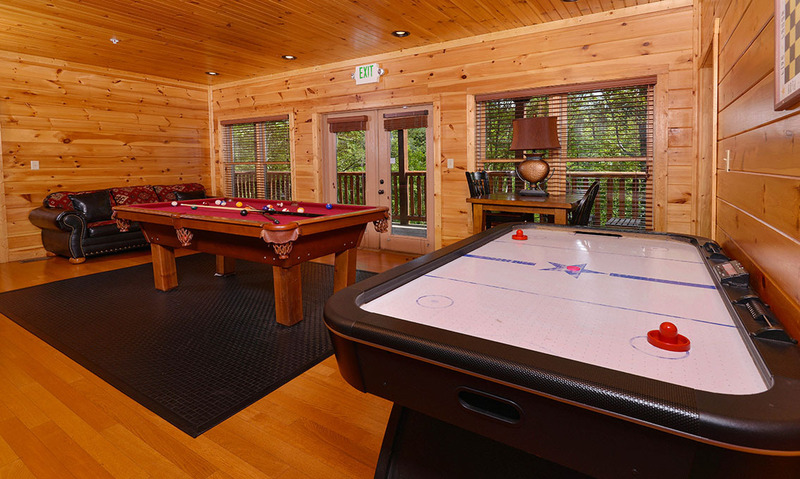 You can shoot some pool, challenge someone to air hockey, or break out a deck of cards and play at the high-top table. There’s also a leather sofa here, where guests can relax between games. 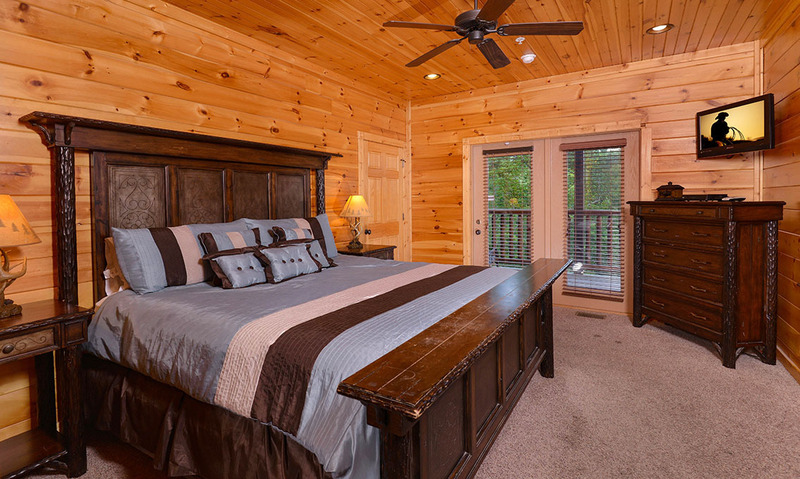 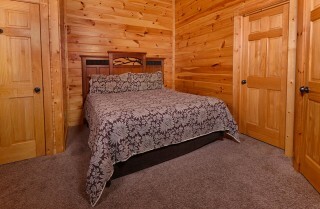 With 9 bedrooms and 8 bathrooms, Bearskin Lodge has space to sleep up to 32 guests. It has 9 king-size beds, 1 queen-size bunk bed, 1 twin bunk bed, and 4 sleeper sofas, so there’s a good mix for kids and adults. 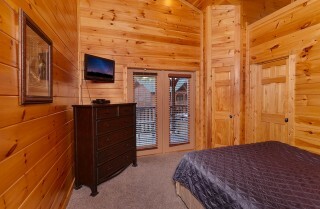 After busy days playing in the national park and downtown, these cozy retreats will be nice to come home to. 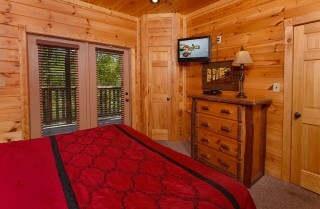 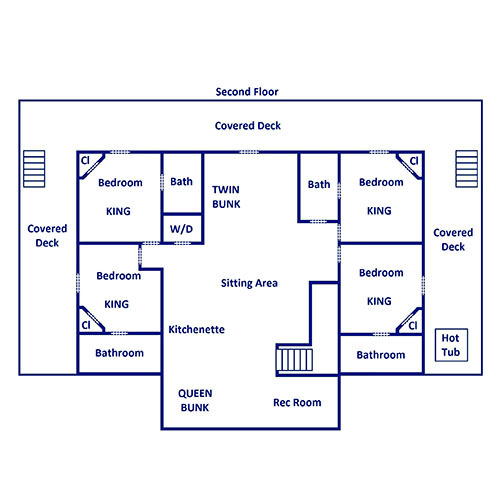 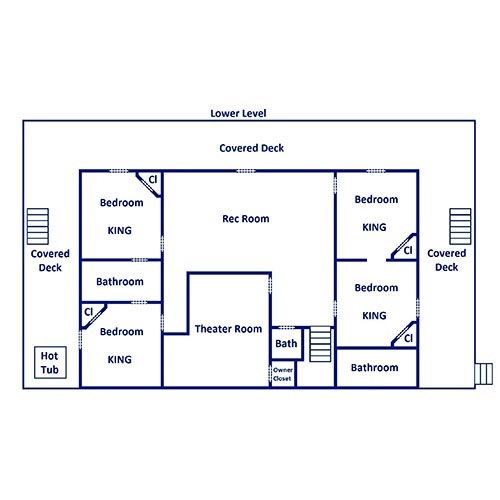 Each bedroom even has its own TV, plus conveniences like dressers and nightstands. 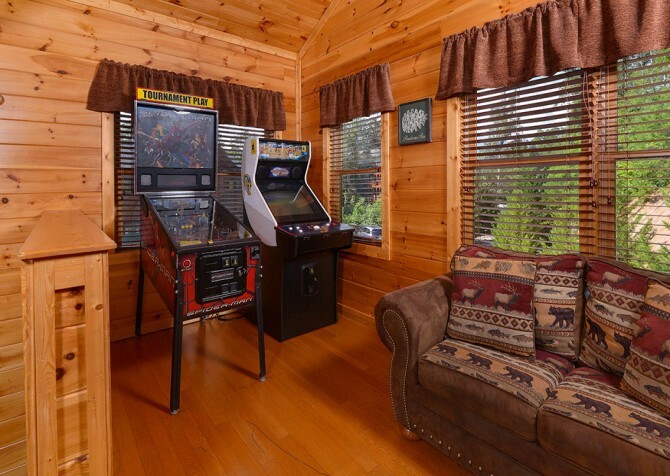 The bunk room/family room is another fun and relaxing space, with a twin bunk, queen bunk, arcade games, pinball, comfy seating, and a wet bar with lots of counter space, bar seating, a dishwasher, a sink, and a microwave. 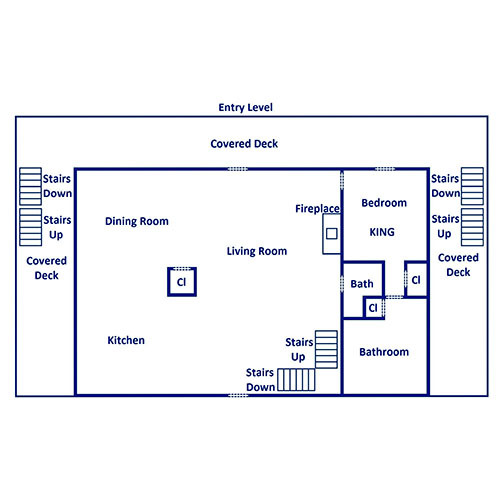 It’s the perfect place to whip up drinks or have some snacks available. 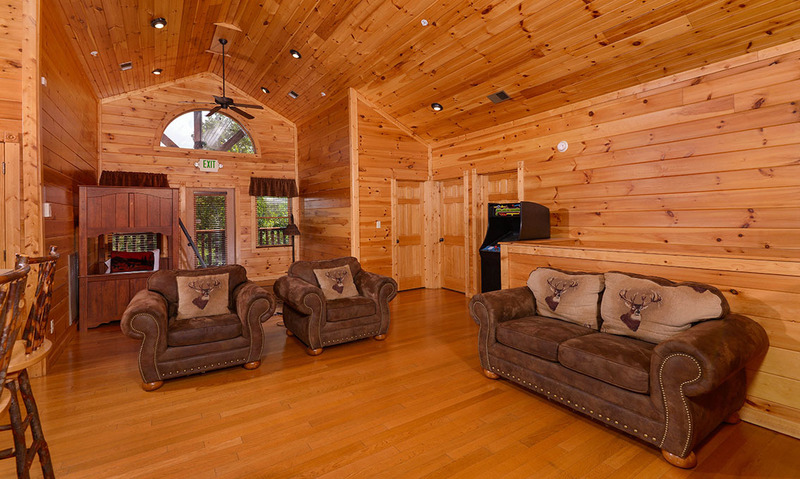 It’s a great space for hanging out, watching some TV, and playing some games. 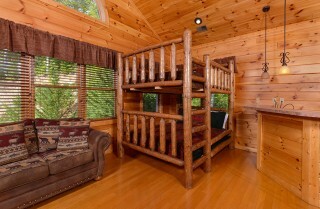 And kids will love having this as their bedroom! 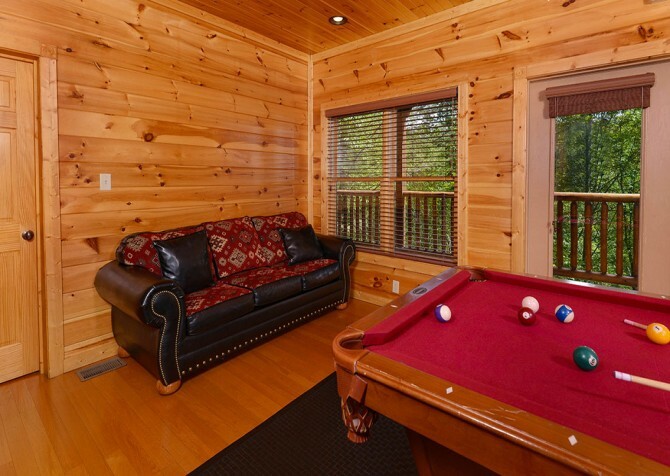 Get some fresh air and enjoy the serenity of the trees as you relax on the decks at Bearskin Lodge. 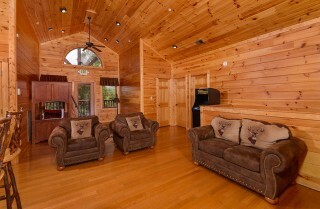 The lodge boasts 3 large wraparound decks with rocking chairs and space to unwind. 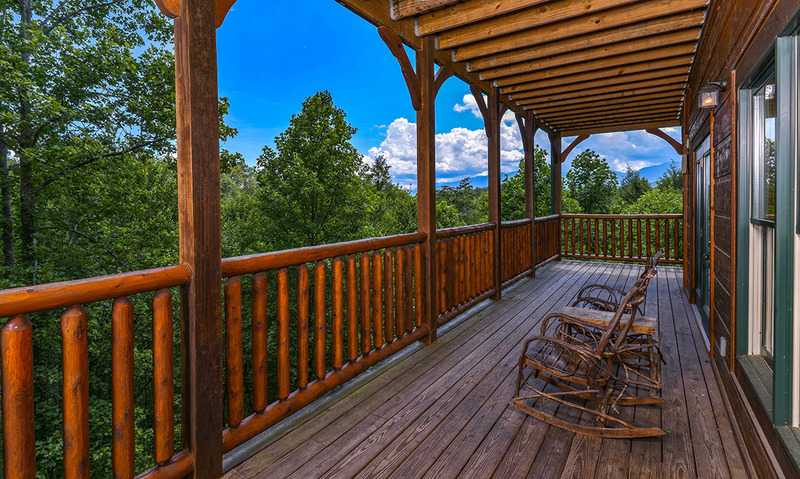 Start your mornings here with a hot cup of coffee as you drink in the views. 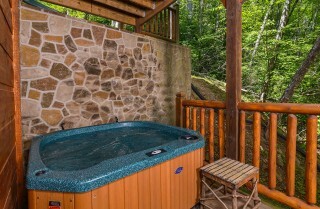 There are 2 hot tubs – one open and breezy and one tucked against a stone wall – where you can soothe tired muscles and unwind after long days. 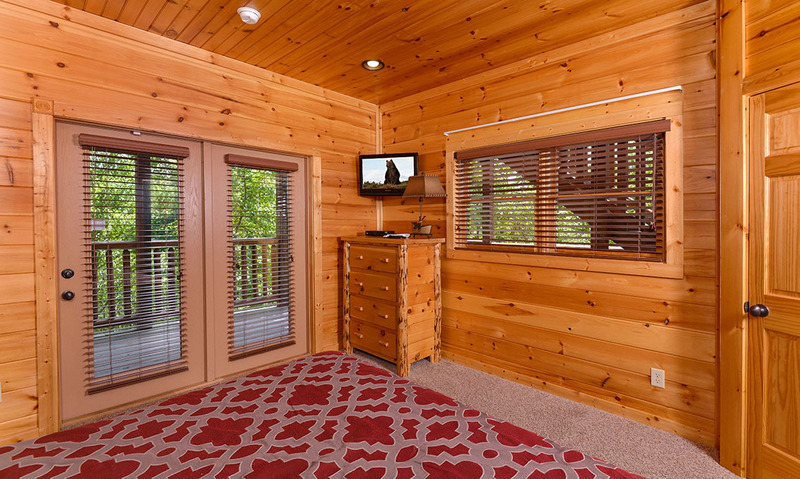 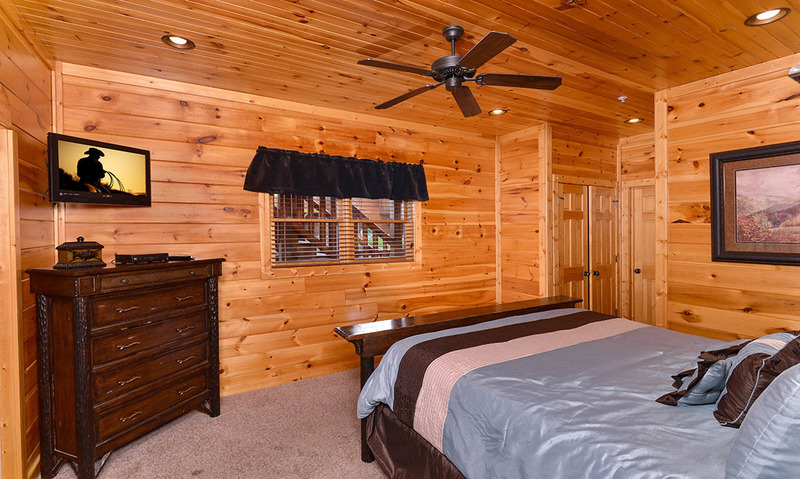 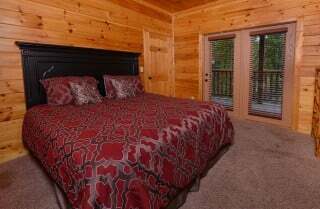 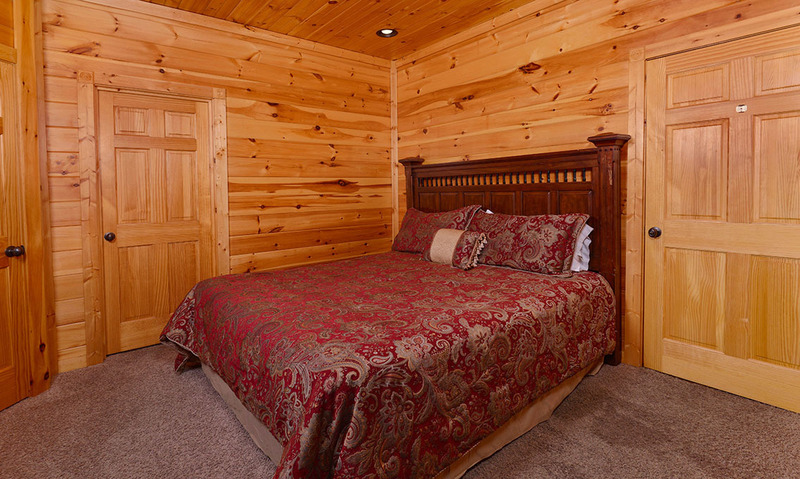 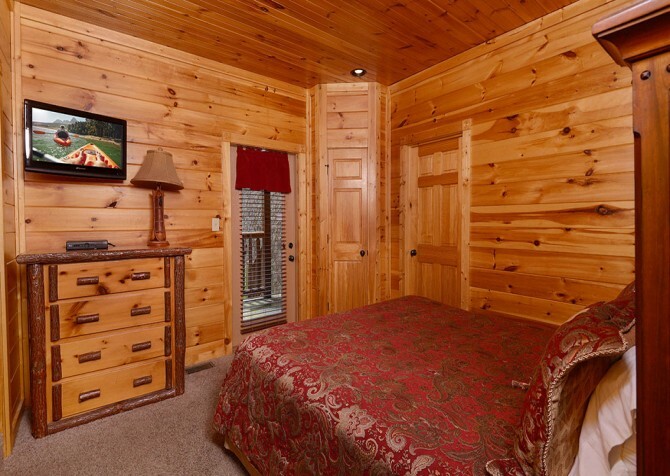 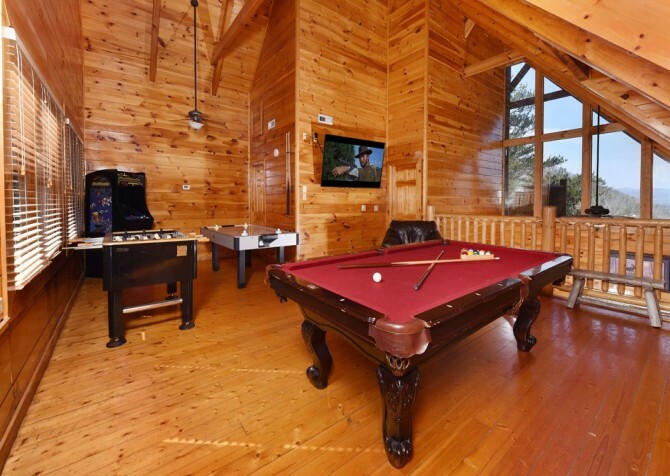 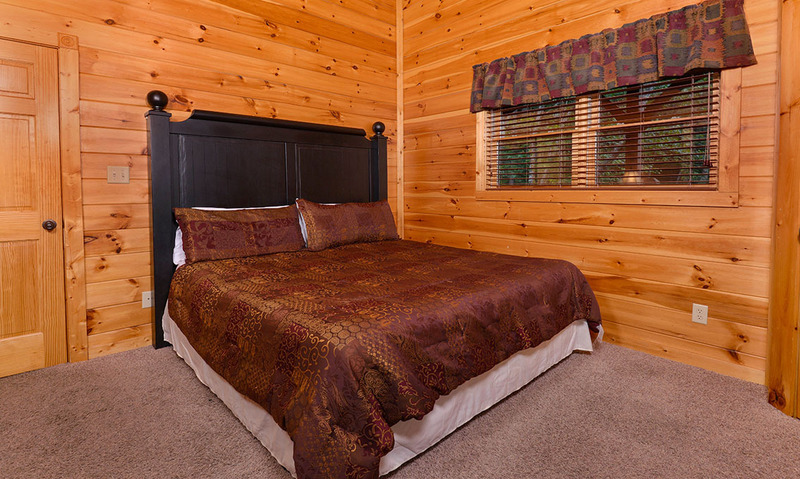 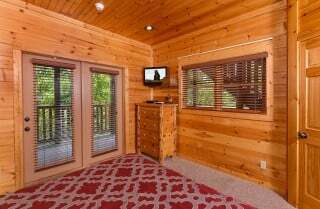 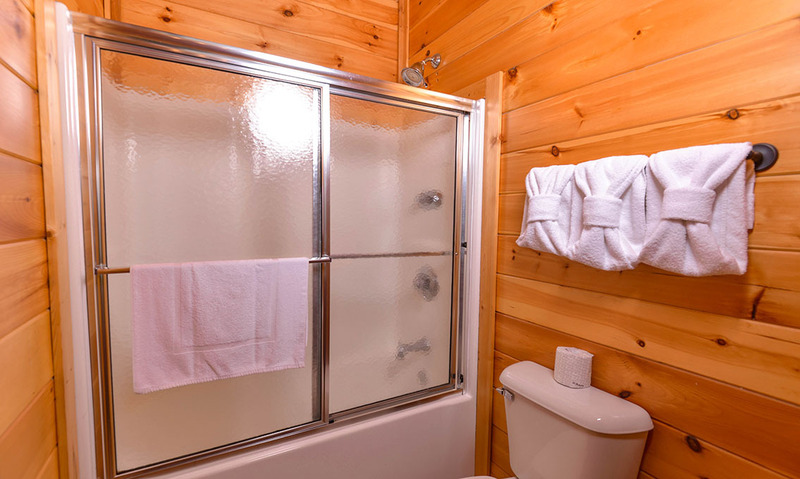 Located in the Gatlinburg Falls at The Glades cabin community, Bearskin Lodge is not too far from the fun of downtown Gatlinburg. 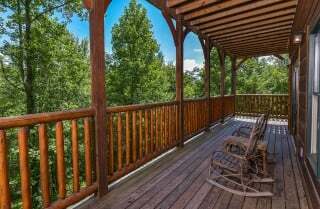 Attractions, restaurants, and shops lint the Parkway, and annual events keep the community calendar jam-packed. 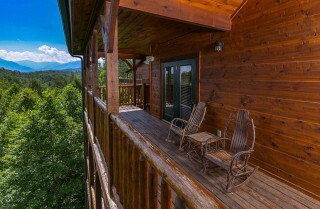 There is always something to do, see, and taste in the Smokies! Ski, snowboard, and tube in winter; ice skate indoors year-round; and try the Alpine Slide, Aerial Tramway, Amaze’n Maze, and more when it’s nice out! 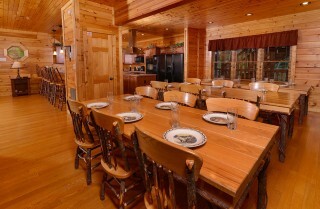 Ober Gatlinburg also has shops, restaurants, and fresh fudge, so there’s plenty for a group! 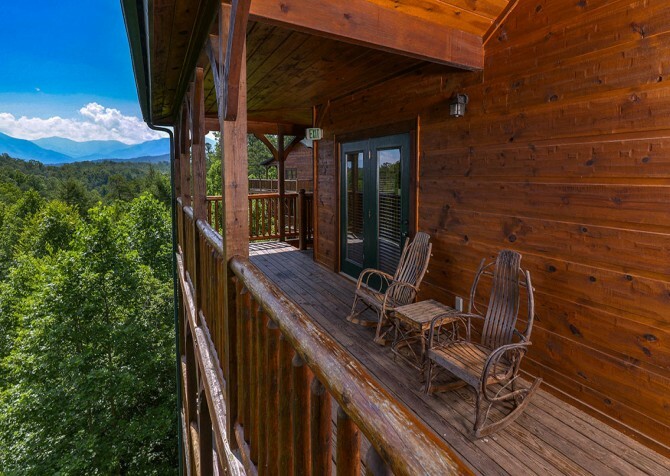 With 800+ miles of trails to explore, the Great Smoky Mountains National Park offers tons of opportunities for hiking, biking, horseback riding, fishing, swimming, scenic walks, and more. 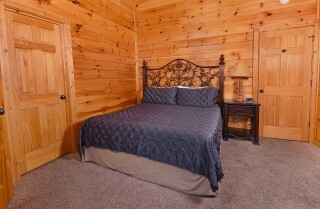 There are also lots of scenic drives and historic buildings to explore! 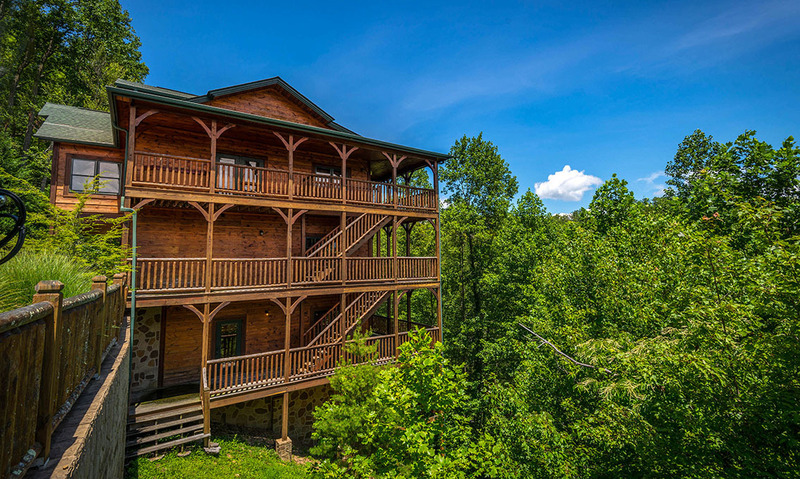 This 8-mile historic loop is home to dozens of talented local artisans that showcase and sell their wares year-round. Spend a day driving around here, where you can grab a bite to eat and meet the artists as they work. Among much more, you’ll find leather goods, baskets, quilts, wood carvings, watercolors, photographs, birdhouses, jewelry, clothing, hand-poured candles, windchimes, and homemade jams and jellies! 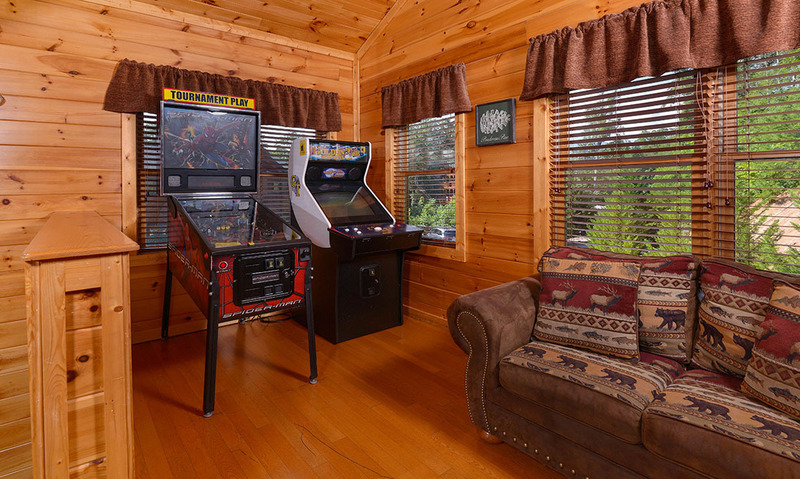 "It was very fun for the kids they just loved it. 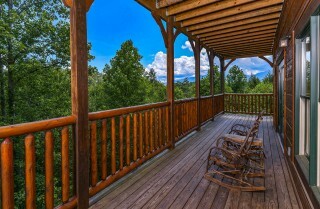 I personally liked watching the view outside on a rocking chair. Cabins for you provided us with everything we needed. I will recommend this cabin for everyone!" Thank you so much for the raving review! We are so happy to hear that you and your guests enjoyed your stay, and hope to have you all stay with us again soon! 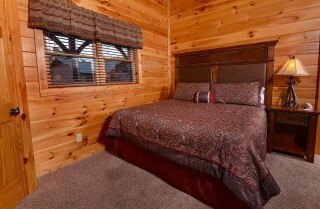 "Cabins For You is the best in this business, please book without a second thought. 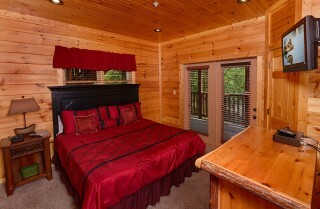 Thank you so much for the hospitality. You will have a great time out there in the cabin. 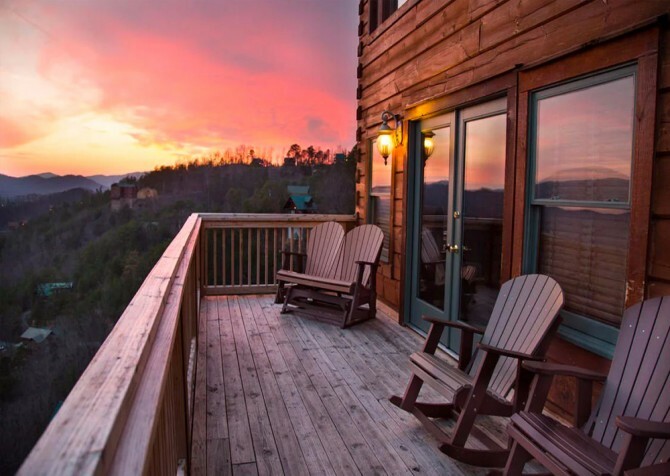 You will enjoy the time of your life. It is very addictive, we might end up most of our vacations there!"